“Sound of My Voice” (2011 production, 2012 release). Christopher Denham, Nicole Vicius, Brit Marling, Davenia McFadden, Kandice Stroh, Richard Wharton, Christy Meyers, Alvin Lam, Constance Wu, Avery Pohl. Director: Zal Batmanglij. Screenplay: Zal Batmanglij and Brit Marling. Web site. Trailer. What we believe makes up who we are. Much of the time we take that for granted, too, never giving our beliefs a second thought. 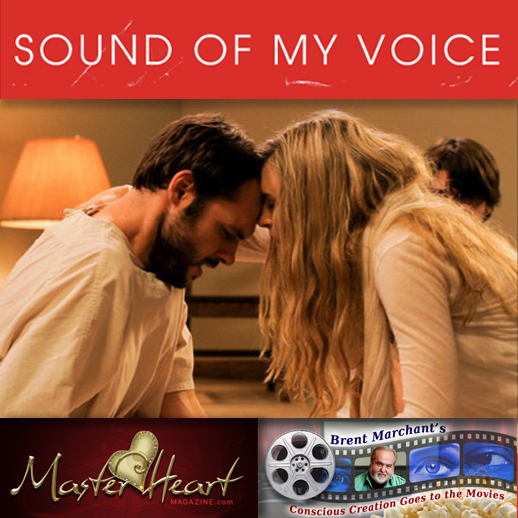 But every so often we undergo profound experiences that prompt us to examine our beliefs and how they form the basis of our reality, a notion explored in the intense independent production, “Sound of My Voice,” now available on DVD. Intrepid documentary filmmakers Peter Aitken (Christopher Denham) and Lorna Michaelson (Nicole Vicius) are so eager to make a movie about cults that they’re willing to secretly infiltrate one to conduct research. Besides the investigative journalism value, Peter has a personal stake in making the film: Having been orphaned at age 13 when his mother, a longtime follower of a new age movement that eschewed the merits of modern medicine, died of cancer, Peter now seeks retribution for the “brainwashing” inflicted upon her by documenting and exposing the alleged fraud and false hope he believes such charlatan-esque organizations peddle to gullible followers. It’s a crusade to which he’s fervently committed – and one that’s eminently more fulfilling than the day job he holds as a substitute teacher at a private elementary girls’ school. After successfully surviving a period of recruitment and scrutiny, Peter and Lorna are indoctrinated into the inner circle of a secret fellowship led by an enigmatic guru named Maggie (Brit Marling). The charismatic, soft-spoken leader offers up her singular pearls of wisdom to a small group of disciples in informal gatherings in the basement of an undisclosed residential location somewhere near Los Angeles. And what’s the basis underlying Maggie’s philosophy/theology? She claims to be a time traveler from the year 2054, having come back to the past to share information about what lies ahead with a select handful of followers, people whom she claims to know and care about in her own future life. Peter initially sees Maggie’s claims as the pinnacle of lunacy, becoming quietly angered whenever he thinks about how she’s preying on a band of weak-willed, vulnerable followers, not unlike what happened to his mother years before. However, the more involved he becomes with Maggie and her minions, the more he loses his focus – and himself – in the mindset of the group. He’s particularly captivated by Maggie’s insights about him personally, revelations that involve information she couldn’t possibly know about him without some kind of foreknowledge – the kind that would come about only from intimate personal interaction. And, since Peter has never met Maggie before, the only way she could possibly have come into possession of such facts would be from interaction that hasn’t yet happened but that could conceivably happen at some other time – like the future. Ironically, such incidents cause Peter to question his own skepticism. As he’s increasingly drawn into the workings of the group, he finds himself ever more willing to comply with the questionable tasks asked of him by Maggie and her lieutenants. At the same time, Lorna grows concerned that Peter is losing perspective, especially when she witnesses some of the dubious activities that Maggie’s closest advisors, like Joanne (Kandice Stroh) and Klaus (Richard Wharton), engage in. More red flags get raised when Lorna learns that Maggie is the target of a Department of Justice investigation led by special agent Carol Briggs (Davenia McFadden). But, given the uncanny disclosures that continue to stream forth as part of Maggie’s cryptic pronouncements, doubt persists about the real truth of what’s going on. Is Maggie who she claims to be? Or is she a flagrant and potentially dangerous fraud? Or is “the truth” even more incredible than either of these possibilities? In the end, it would seem, it all comes down to what one believes. But, then, when it comes to assessing the reality we experience, it always comes down to the beliefs we employ in manifesting our existence through the conscious creation process, and that point is driven home subtly yet repeatedly in this film. For the followers of her group, Maggie becomes exactly whoever each of them needs her to be. In doing so, she assumes a chameleon-like persona reminiscent of the unassuming gardener Chance (Peter Sellers) in the whimsically delightful comedy, “Being There” (1979). For those who need Maggie to be a prescient time traveler, she’s a prescient time traveler; for those who need her to be a new age con artist, she’s a new age con artist; and for those whose personal uncertainty calls for her to be an inscrutable enigma who ambiguously seems to embody qualities alluding to both of these characters, she once again complies accordingly. In each instance, though, the beliefs of those perceiving her govern which permutation appears in each of their respective individual realities, for better or worse and regardless of whether seemingly contradictory qualities are involved. To some, this may sound like a notion devoid of credibility. But, if we assume that our individual beliefs shape all of the other elements of the reality we each experience, why should it be any different for the beliefs we associate with the people who populate our realities? In fact, we already do this, often unwittingly and even if we don’t readily associate the “creation” aspect with it. Why, for example, would one person perceive another individual as a paragon of virtue while another perceives that “same” individual as an unmitigated jerk? In both instances, the characterizations are defined by the beliefs of those doing the perceiving/manifesting. So it is also with Maggie. In this film, however, the characters’ beliefs have implications far more significant than just what version of Maggie crosses their paths. They delve into much deeper subjects, such as the concept of time travel and whether it’s possible. That, in turn, raises other profound questions, such as would Maggie’s appearance in her past alter the course of the timeline going forward? Could her presence in contemporary Los Angeles potentially have a temporal “butterfly effect” for the events leading up to the time from which she claims to have come? Would such alterations affect her alone or all involved? Again, it all turns on one’s beliefs, for they dictate what manifestations arise. This, of course, raises questions related to the notion of choice and how what we choose determines what we ultimately experience. It also underscores the importance of personal responsibility, for each of us is accountable for what we choose to believe and what we each materialize as a result of those choices. Exercising care and caution would be a wise course in this pursuit, for embracing the “wrong” choices can potentially carry consequences that fly in the face of hoped-for expectations. Indeed, whether our choices involve matters as seemingly innocuous as what to have for breakfast or as seemingly life-changing as whether to join a cult, in each case we should all strive to choose wisely. “Sound of My Voice” is a thoughtful meditation on the foregoing considerations, going far beyond the surface attributes of its narrative. Much of the picture’s action takes place in the aforementioned basement, shot close-up, creating an intimate, almost claustrophobic feel that closes in on the characters (and, by extension, the viewers), effectively emphasizing the intensity of an experience that impels serious examination of oneself and one’s beliefs. The crisp writing and fine performances serve to bring all of this to life, making for a viewing experience one soon won’t forget. While “Sound of My Voice” didn’t exactly set the box office on fire when it was released in early 2012, it nevertheless made an impression with independent film fans. In fact, the picture was deservingly honored with two nominations in the recent Independent Spirit Awards competition, earning nods for Marling as best supporting actress and the film as best first feature. If this picture is any indication of the capabilities of director Zal Batmanglij, I can’t wait to see what he comes up with next. Beliefs are powerful forces that can frame our existence or shake us to our very core, as the characters in this film find out for themselves in many different ways. What we do with those beliefs, and how we respond to the materializations that they birth, impact what we experience, both now and in the future that lies ahead of us. “Sound of My Voice” draws these ideas sharply into focus, giving us pause to think about who we are, where we are and, perhaps most importantly, where we’re going. We’d be wise to give serious thought to such notions; after all, our future depends on it.